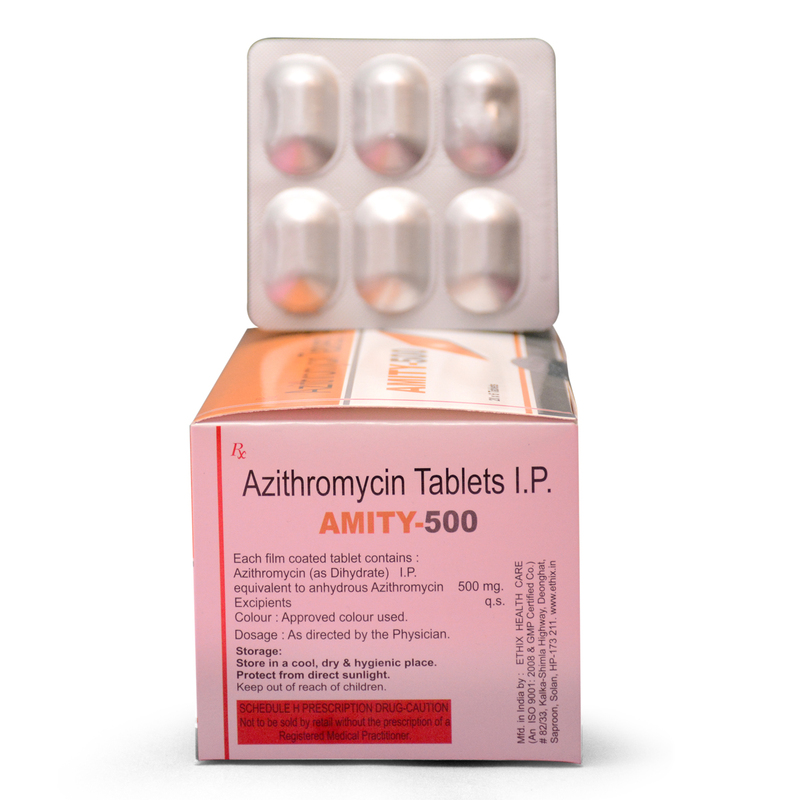 What is Azithromycin in Amity-500 for? How should Azithromycin in Amity-500 be used? Continue to take it even when you feel better. You must complete the entire course of antibiotic. If you don’t, the infection will not clear completely. If you have been given capsules, take them on an empty stomach at least 1 hour before or 2 hours after food, with plenty of water. If you have been given tablets, swallow them whole with plenty of water. Common side effects are belly pain, upset stomach or throwing up. 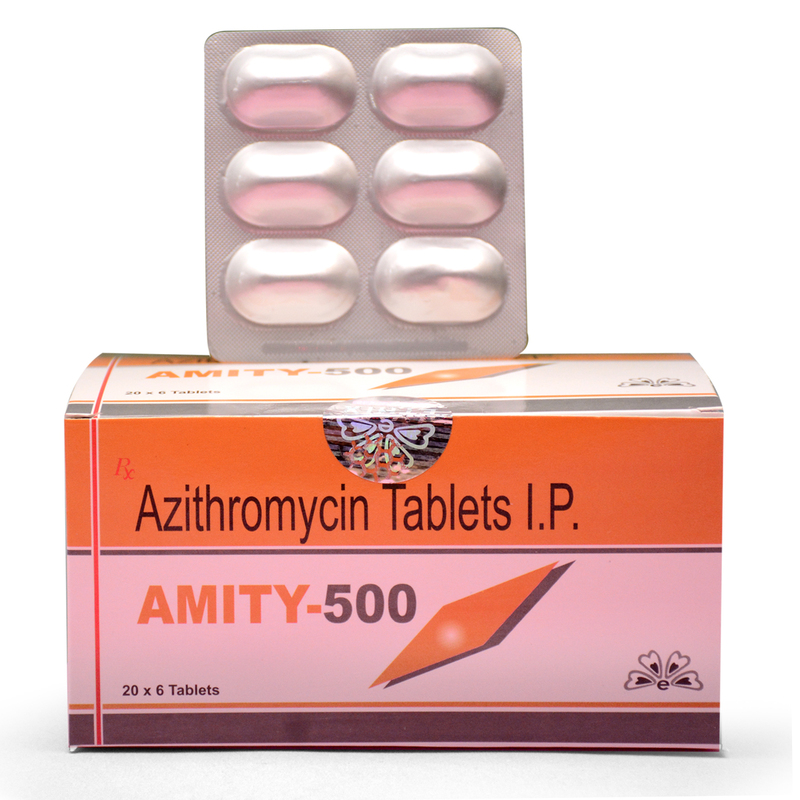 What precautions should I take when taking Azithromycin in Amity-500? Alert your doctor if you have a history of allergic reactions (breathlessness, rashes, swollen mouth or eyes) to similar antibiotics such as clarithromycin, erythromycin or any other macrolide antibiotics. If you think there was an overdose, call your local poison control center or ER right away. – Signs of a very bad reaction to the drug. These include wheezing; chest tightness; fever; itching; bad cough; blue or gray skin color; seizures; or swelling of face, lips, tongue, or throat. Can I take Azithromycin in Amity-500 with other medicines? Do not take antacids together with Azithromycin. Antacids could reduce the effectiveness of Azithromycin. If you must take antacids, take them at least 1 hour before or 2 hours after Azithromycin. – Alert your doctor if you are taking any other medicines, especially those listed here: – heart medicines such as digoxin, digitoxin and amiodarone. How do I store Amity-500? Store in a cool, dry place away from the reach of children, medicines must not be used past the expiry date. Vitamins are needed for growth and good health. Vitamin E in FertiDay is thought to protect the body from the harmful effects of a chemical reaction known as oxidation. Vitamin E in FertiDay is important for many processes in the body. Vitamin E in FertiDay is prescribed to treat a deficient state or as a supplement. It is also prescribed in certain other conditions like cystic fibrosis and abetalipoproteinemia. Enzovit drops used to promote healthy stomach acidity, gastric function and the digestion of protein. Mint is thought to increase bile secretion and encourage bile flow, which helps to speed and ease digestion. Peppermint can cause some side effects including heartburn, and allergic reactions including flushing, headache, and mouth sores. Everliv is a composition containing various Indian Herbal extracts specifically given as Tonic to the Liver. Improves appetite and controls total Metabolic activities.